This is so cool that it… never actually happens in the comic. That makes me sad. Before returning home from Morocco John makes a stop in the jungle to ask for Double’s help contacting Hazard about the implant that faked his metahuman powers. Then he stops in Washington DC to visit Colonel Weston to see if he knows anything about it. Both of Steel’s former enemies deny any connection to the device. While this is going on a man’s family is killed. He used to be part of a gang under the name Crash but he left the life and faked his death to turn evidence. Years later the gang leader sent someone to kill his new family and friends but leave him alive (unless he’s bulletproof or something). So he became Crash again to get Punisher-style revenge. He and John show up at the old Irons’ home where Natasha’s friend now lives and it’s revealed that Crash is John’s brother and possibly Natasha’s dad. Meanwhile, Skorpio sends flowers and an apology to Amanda while both John and Crash separately get tickets to Jersey City. What they got right: Finally, a connection to the stories that got me interested in Steel, while this run slowly did the opposite. The idea that John’s brother is still alive could make for interesting drama. What they got wrong: Another issue where Steel doesn’t wear the armor and just has that utility outfit. Why design a cool new look that you don’t seem to want to use? 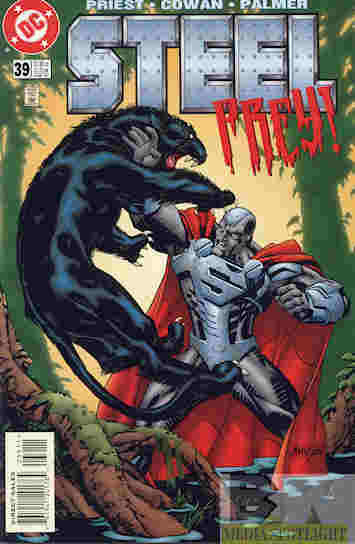 I don’t think Priest wanted to focus more on the urban soap drama than the superhero parts, with occasional moments of monsters and super-science. I guess Priest decided he needed to come up with a reason for the implant now that he used it to eliminate the “metahuman” nonsense but I’m not convinced the payoff will be worth it. They could have just blamed it on Weston somehow (Hazard was surprised the first time the teleportation power manifested so I don’t think he knew anything about it) and finished washing it away. Recommendation: If you like stories more like the ones Milestone like Hardware you might like this run. I however was happy with the comic the way it was and I just can’t get into most of this run. Posted by ShadowWing Tronix on June 18, 2018 in DC Spotlight, Yesterday's Comics and tagged DC Comics, DC Universe, John Henry Irons, Steel.